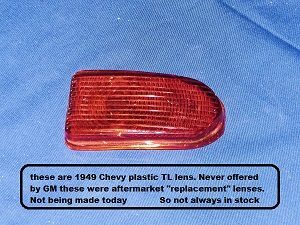 1949 Chevy Taillight Lens made of plastic is listed here. The lens is a reproduction of the original 1949 GM replacement lens, red in color. This plastic taillight lens is not being made today so it is a NOSR “new old stock replacement” lens from the 50’s. Glass or plastic does not matter for 1949 Chevy, neither one is being made today. The main reason the 1949 lens is not being made today “in my opinion” is because the 1950 is much more popular so sales of the 1949 lens are much lower. Also the 1950 taillight lens is more popular and fits both years. The original GM lens supplied in 1949 was made of glass. You will find a glass version of this lens listed elsewhere on this page. These plastic lenses were a replacement lens sold in auto parts stores similar to NAPA. Both lenses fit well and are easy to replace. 1. price, cheaper than buying from a Chevy dealer. 2. availability, auto parts stores were on every corner. 3. less breakable, is you dropped one they normally would not break. Glass will. One thing interesting about the 1949 and 1950 Taillight Assembly. On one side of the “bucket”, that part of the assembly that everything mounts to including the socket, there is a clear plastic lens. When mounted on the car that clear lens should face into the trunk. It is there to act as a “TRUNK LIGHT” when the taillights are turned on.